Today MMA is the fastest growing sport in North America. It is exhilarating to watch as highly conditioned & well trained athletes showcase their skills in a relentless competition. There are numerous techniques used in MMA including- takedowns, throws, punches, kicks, knees, elbows and submission holds. Classes are instructed by professional fighters. You will learn all the skills of a true warrior and get into the best shape of your life. Time is allotted for full contact sparring after class for those wishing to compete or challenge themselves. In our MMA classes participants’ must wear MMA handwraps, 4 oz MMA gloves, a mouth piece, a cup, and shorts with a t-shirt. 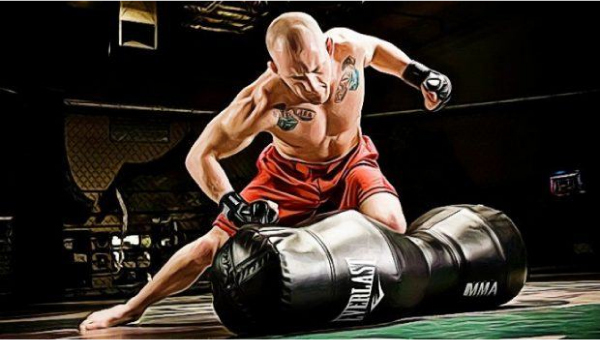 Our MMA classes focus on ground fighting utilizing techniques from Brazilian Jiu Jitsu and wrestling while incorporating strikes, throws, takedowns and takedown defense. The concept of Mixed Martial Arts dates back to the ancient Greek Olympics of 648 B.C. when it was called Pankration, meaning all powers. In the modern era, MMA was originally created as a way to test the capabilities of various martial arts against each other in a neutral forum with minimal rules.